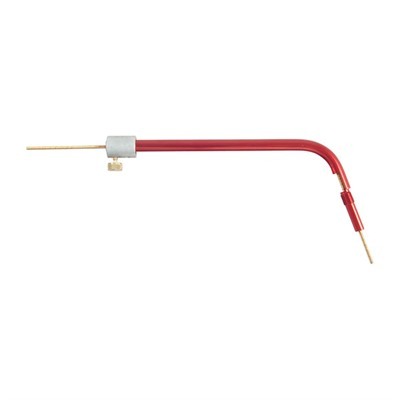 The Hornady Lock-N-Load OAL Gauge (formerly Stoney Point) is an extremely easy to use tool. It only takes a couple of minutes to find the overall length for a particular bullet. The tool is threaded on one end to accept specially modified cartridge cases. Once threaded onto the tool, a bullet is inserted into the cartridge. The tool is then inserted into the chamber of your rifle. The push rod on the tool is used to push the bullet up against the rifling. The rod is then locked in place and the tool can be removed from the rifle. You then measure across the base of the cartridge and the top of the bullet with your dial calipers (use of a bullet comparator at this time is highly recommended) to obtain the OAL. If you want to check another type of bullet, insert the new bullet into the tool and repeat steps. There are two different models of OAL Gauge tools available. Straight is designed specifically for bolt-action rifles and single shot rifles. The Curved model is designed for autoloaders and lever actions. Both models utilize the same modified cases. Either tool will work on the AR-15 type rifles. This tool is excellent for periodically checking the throat erosion of a rifle barrel. Great for checking out used rifles. There are over 60 different modified cases available to use with this tool. 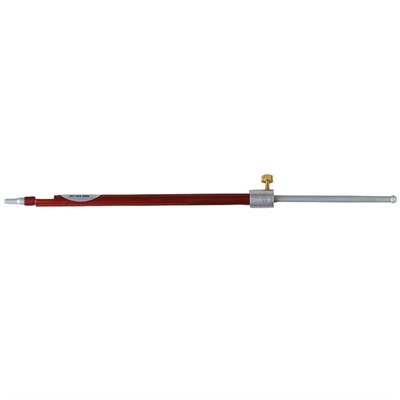 SPECS: Gauge- Machined aluminum, 12" (30cm) long, anodized finish, red. Straight Gauge for bolt and single shot actions. Curved Gauge for auto, pump, and lever actions.